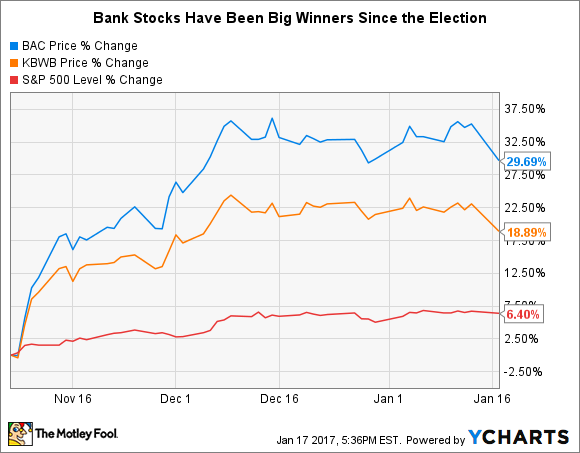 Bank stocks retreated on Tuesday, as investors begin to temper their optimism toward the incoming administration. Shares of Bank of America (NYSE:BAC) fell precipitously on Tuesday, dropping by more than 4% on the eve of the presidential inauguration this Friday. A multitude of factors no doubt played into the decline, but there are two in particular that seem to be the primary culprits. Analysts at Citigroup opined this week that investor confidence in the incoming presidential administration may be waning. An index that attempts to capture this, the News Implied Sentiment Indicator, has reversed most of its post-election climb. The metric, which measures the number of Bloomberg News stories that contain the words "bullish" and "bearish," is a crude metric to be sure. But there could certainly be something to it -- at least in the case of bank stocks. Shares of the nation's biggest banks surged in the wake of the presidential election. A Republican-controlled federal government combined with promises made by the incoming administration on the campaign trail to roll back regulations and accelerate economic growth by way of tax cuts and infrastructure spending, persuaded investors that banks could soon start to earn a lot more money. Few banks stand to benefit as much as Bank of America, which has seen its stock climb 30% over the past two months. Higher interest rates spurred by raster economic growth would boost Bank of America's top and bottom lines more than any other major bank. Moreover, because of its missteps leading up to the financial crisis, the North Carolina-based bank has been under the watchful eye of regulators ever since. This has driven up its compliance costs and impeded its ability to return capital to shareholders. The question now is whether investors were too optimistic that the new President will be able to deliver on his campaign vows. The answer to this remains to be seen, but the sharp decline in bank stocks Tuesday, coupled with Citigroup's analysis of investor sentiment, suggests that investors are dialing back their expectations. The second piece of news that seems to have weighed on Bank of America's stock on Tuesday relates to the Supreme Court. The court refused to hear an appeal by the bank, joined by Citigroup and JPMorgan Chase, challenging antitrust lawsuits accusing the banks of conspiring to rig a key short-term interest rate benchmark, the London Interbank Offered Rate, or Libor, going back decades. The ruling leaves Bank of America and other banks vulnerable to potentially billions of dollars' worth of damages suffered by investor who held securities tied to Libor. "The wrong result here could be economically devastating," argued the banks. The case could still be dismissed or settled, but the added uncertainty is never a good thing for stocks. In sum, I still believe that Bank of America is a very good stock to own for the long run, but the road is bound to be bumpy.